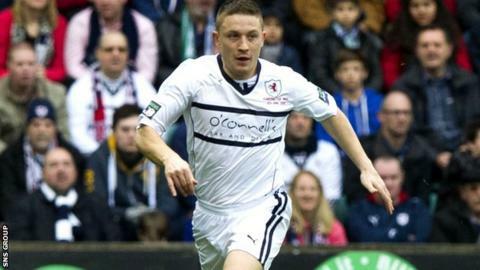 John Baird scored with nine minutes remaining as Raith Rovers saw off a comeback from Queen of the South. Joseph Cardle shot the hosts ahead from close range after four minutes and Paul Watson fired in soon after. Marc Durnan levelled with two headers late in the first half before Baird turned in Ross Callachan's pass. Reece Donaldson was shown a second yellow card in the final stages but Rovers held on to move up to seventh spot in the Championship. Queen of the South stay fourth and remain level on points with play-off rivals Dumbarton, with three games of the season remaining. Chris Mitchell was the supplier for both of Durnan's goals but it was not enough to prevent the visitors falling to their third defeat in four games. With Ramsdens Cup final hero Baird knocking in the winner, Rovers are now nine points clear of Cowdenbeath in the relegation play-off place. Match ends, Raith Rovers 3, Queen of the South 2. Second Half ends, Raith Rovers 3, Queen of the South 2. Joe Cardle (Raith Rovers) wins a free kick on the left wing. Substitution, Queen of the South. Kevin Holt replaces Chris Higgins. Substitution, Queen of the South. Daniel Carmichael replaces Iain Russell. Joe Cardle (Raith Rovers) wins a free kick in the attacking half. Substitution, Queen of the South. Lewis Kidd replaces Stephen McKenna. Substitution, Raith Rovers. Fraser Mullen replaces John Baird. Second yellow card to Reece Donaldson (Raith Rovers). Foul by Reece Donaldson (Raith Rovers). Goal! Raith Rovers 3, Queen of the South 2. John Baird (Raith Rovers) right footed shot from the centre of the box to the bottom left corner. Assisted by Ross Callachan. Derek Lyle (Queen of the South) wins a free kick on the right wing. Foul by Callum Booth (Raith Rovers). Attempt missed. Calum Elliot (Raith Rovers) right footed shot from a difficult angle on the right is close, but misses to the left. Attempt missed. Gordon Smith (Raith Rovers) header from the centre of the box is close, but misses the top left corner. Gordon Smith (Raith Rovers) wins a free kick on the left wing. Iain Russell (Queen of the South) wins a free kick on the right wing. Attempt missed. John Baird (Raith Rovers) header from the left side of the six yard box is close, but misses to the left. Corner, Raith Rovers. Conceded by Chris Mitchell. Attempt blocked. Ross Callachan (Raith Rovers) right footed shot from the centre of the box is blocked. Attempt saved. Iain Russell (Queen of the South) left footed shot from outside the box is saved in the top centre of the goal. Substitution, Raith Rovers. Ross Callachan replaces Kevin Moon. Reece Donaldson (Raith Rovers) is shown the yellow card. Paul Burns (Queen of the South) wins a free kick on the right wing.